Click the Image on the right for a larger view of the document. of this union that was in their power, and learning that this plea was made, sent out the expedition alluded to under General Woll. Their expressed intention was to march through the territory; but their real intention was to make a raid, and thus delay, and if possible thwart annexation, hoping in the end to induce Texas to submit to Mexican rule. On the eleventh of September 1842, a Mexican force, under General Woll, about thirteen hundred strong, captured the city of San Antonio, making hostile demonstrations towards other points farther east. Both William and Moses participated in the Vasquez and Walls Campaigns in 1842. 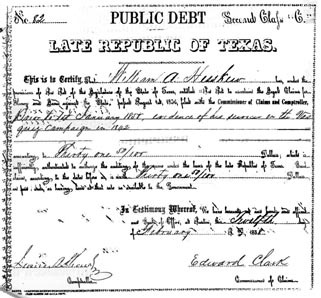 As a result William was awarded property for his Services by the State of Texas in 1856 specifically for the Vasquez Campain. The Vasquez Campaign which occurred in March was similar in nature to the Woll's expedition but with less fanfare. General Vasquez did not encounter any major forces by the Texans and was back across the border within a short time of capturing San Antonio. William participated in the ousting of the Mexican forces commanded by Gen. Vasquez who had overrun San Antonio in the Spring of 1842 as well as the Walling Campaign in the fall of 1842. The Mexican General, Adrian Woll, with 8 hundred or a thousand Regulars Cavalry & Infantry 2 small pieces of Artillery captured San Antonio and then later attack a small force of Texans, about 200 men outside of San Antonio in what has come to be called the Battle of of Salado. ( William Hesskew is mentioned specifically in this battle on page 2 , paragraph, 3) Following the Battle of Salado, is the well documented Battle of Hondo which both William and Moses Heskew probably participated in. Additionally Moses was a sheriff, a farmer , a rancher, and a teacher it is said. He fought Indians and probably had a run in with a cowboy or two in his day. 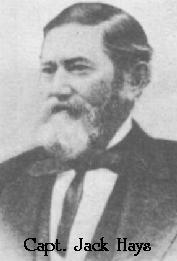 In fact one can say for certain that both William and Moses would rode with the Texas Rangers commander of Lonesome Dove fame, Captain Jack Hays, in fighting off the Mexican army invasion in the Battle of Salado , as Jack Hays commanded various forces at different times during these engagements. Editors Note : There is as town named Salado , which is north of Georgetown, Texas on I-35. But the Battle of of Salado occurred on the Salado Creek which runs northwest to southeast through Bexar County and eventually joins the San Antonio River south of San Antonio. Now Salado Creek is actually in San Antonio, however, when they were doing all that fighting, it was north and east of what was San Antonio. See Map of Battle Grounds here. The following page gives a flavor for why the Mexicans invaded Texas in 1842. President Houston is referring to the Vasques and Walls Campaigns that both William and Moses Heskew participated in. In the meantime President Houston had been trying to bring pressure on Mexico through the mediation of the strong foreign powers. The United States, as we have seen, recognized the independence of Texas in March, 1837, by accrediting to the republic a charge daffaires. France recognized it by concluding a treaty of commerce and friendship on September 25, 1839, which was ratified on February 14, 1840. British recognition was obtained in a series of treaties concluded in November 1840, but these were not ratified until June 28, 1842. One of these British treaties was an agreement on the part of England to urge upon Mexico the recognition of Texas, and Lord Aberdeen on July 1, 1842, instructed the British charge at Mexico to make the necessary representation to the Mexican government. This was done, but the overture was rejected. Immediately following the ratification of the British treaties an effort was made to get France, England, and the United States to make a joint demand on Mexico for recognition. But England refused to become a party to this tripartite action. At the same time, however, Lord Aberdeen suggested that the three governments might make identical representations on the subject to the Mexican government. Appropriate instructions were accordingly issued to the diplomatic agents of England and France for making such a representation, but these agents, knowing the uselessness of such action, did nothing. On October 15, 1841, just after the retreat of General Woll from San Antonio, President Houston again appealed to the powers to use their influence to compel Mexico either to recognize the independence of Texas "or to make war upon her according to the rules established and universally recognized by civilized nations." "It has now been nearly seven years since the declaration and the establishment of the independence of this republic. During the whole of this time Mexico, although uniformly asserting the ability and determination to re-subjugate the country, has never made a formidable effort to do so. Her principal war has consisted of silly taunts and idle threats, of braggadocio bulletins and gasconading proclamations. All her boasted threats of invasion have resulted in nothing more than fitting out and sending into the most exposed portions of our territory petty marauding parties, for the purpose of pillaging and harassing the weak and isolated settlements on our western border." Mexico s object, he said, was merely to keep alive its claim to Texas and to retard the development of the country by threats that it had neither the intention nor the means to carry out.